APRIL 2015 Palm Sunday in 1965 looked like a keeper. Fifty years ago, people woke April 11 to clear skies and unseasonably mild temperatures. Children thought about going out and flying kites against the backdrop of pretty, puffy white clouds. Others went for walks or bike rides. What no one knew was that earlier that day a cold front slammed into the warm body of air coming up from the Gulf of Mexico. By late morning, as churches were ending their services, even the unsophisticated radar systems used by weather forecasters in Chicago were picking up the makings of dangerous weather conditions across Missouri and Iowa. By 1 p.m., they were concerned enough to notify Chicago radio stations, who delivered a “severe weather warning” for the northern Illinois and northern Indiana. 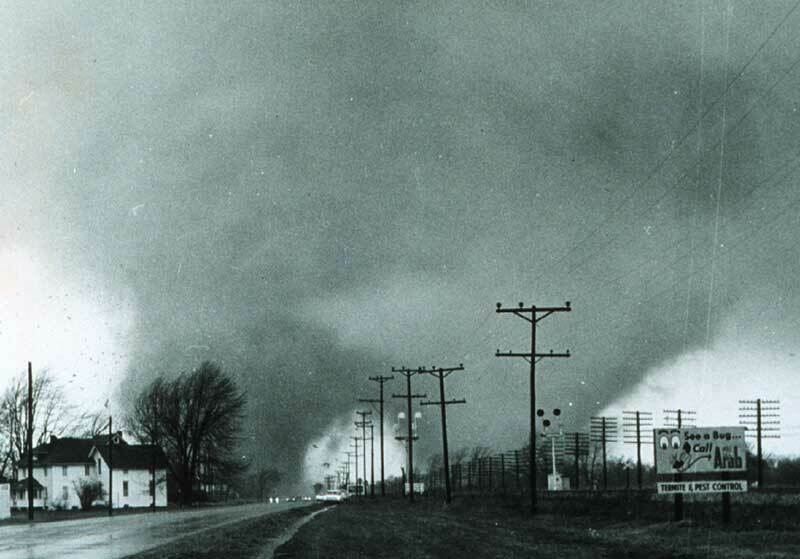 Back in 1965, emergency sirens were not purposed to give tornado warnings. They were used for national military civil defense purposes. Today, those and additional sirens are available to give momentary emergency warning to take cover as storms bear down. Still, in many modern-day tornado situations, some survivors say they either did not hear any sirens or heard them only seconds before the tornado hit. Sadly, in 1965, few were listening to the radio on such a nice early spring day. Their thoughts were on a pleasant evening to come. A “Stormstalker” post noted, “While concerning to some who had heard the news of incoming bad weather, most continued their day without a second thought.” Even the radar operators were unable to notice that multiple tornados were already touching down across Iowa and western Wisconsin in the early afternoon. To most other eyewitnesses, the tornado simply “dropped out of the sky.” It was 3:27 p.m. Much later on, it was determined the F-4 tornado, packing winds in excess of 200 mph, first dropped down in the Coventry subdivision before jumping over a crowded restaurant at Route 14 and Virginia Road. It then smashed into a Piggly Wiggly grocery store in the Crystal Lake Plaza. The funnel tore furiously through the Colby subdivision behind the plaza and then lifted momentarily back into the air. It returned to Earth to smash into the Oak Manufacturing plant, among the county’s largest employers at the time. Harry Dillon, drafted by the city’s disaster chairman Al Querhammer to be its emergency housing director, said he was completely unaware of the storm until he left a board meeting at St. Mary’s Episcopal Church. “We knew we had a thunderstorm, but we certainly didn’t know it was blowing like that,” Dillon said. “Garbage cans and lawn chairs flew out of the clouds and landed on yards across the street.” Dillon, 86, of Crystal Lake, recalled seeing shocked people “walking around like zombies.” One man was taking a shower when the tornado ripped the roof off his house and left him standing naked in the tub. Another was balancing his checkbook when the storm struck. “A couple days later, he was getting calls from Waukegan,” Dillon said. “People had picked up his checks over there.” Dillon, who was tasked with finding temporary housing for the displaced, soon realized finding a suitable site for a temporary trailer park paled alongside the challenge of providing sewer and water. Richard Holter, an automobile salesman for Ormsby Motors was killed along with his wife, Rosalie, and son, John. Also killed were Louis Knaack, an assistant treasurer at the Oak Manufacturing Co., and Rae Goss, a vice president of the Inland Lithographing Co. Kenney credited Goss with saving numerous lives, herding teenagers who had been playing basketball in his remodeled barn into his basement just before the tornado struck near what is now Country Donuts. While returning to the barn to double check for stragglers, the top half of the structure toppled onto him. He was the tornado’s first victim.